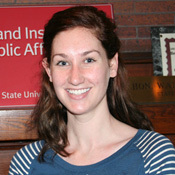 Katie Johnston graduated from Saint Louis University in 2011 with her bachelor’s degree in International Studies and Spanish. She earned her master’s degree in Public Administration at Rutgers University-Camden, and enjoyed the opportunity to put into practice the skills she has developed in the classroom to address the management and policy challenges of her work on the Prevention Project. She plans to continue to work as a consultant in the public sector. Page last updated by Senator Walter Rand Institute for Public Affairs at 12:36 pm August 2, 2016 . This page was printed from http://rand.camden.rutgers.edu/2015/09/16/johnson-katie/ at 4:06 PM Monday, April 22, 2019.